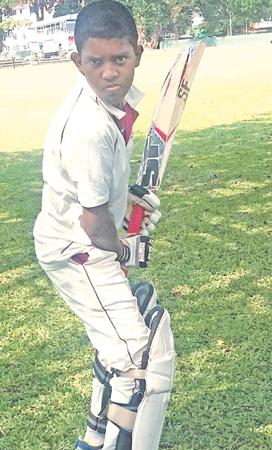 Yasindu Dissanayake, a young cricketer from Royal College, Colombo maintains an impressive record in the Singer Under 13 Division III school cricket season first round in 2018. Yasiru’s batting prowess have been instrumental in many Royal ‘C’ team victories this season. The grade 6 lad has shown great promise in his career. He scored a well compiled 47 runs in Royal’s season opener against Sri Subuti National School, Battaramulla. In their second match against Maharagama President’s College, Yasindu was unfortunate to be run out as he collided with his fellow teammate batsman when he was at 28. His brisk innings included five boundaries. In the third match Yasindu displayed some superb batting skills and scored an unbeaten 87 runs including 16 boundaries against St. Sebastian’s College, Moratuwa. In the last match of the first round Yasindu notched up an unbeaten 47 runs including six hits to the ropes against Lyceum International School, Nugegoda. Yasindu’s consistent batting talent as an opener has helped Royal College ‘C’ team to lay a solid foundation at the early stage of the innings in many matches. He is well verse in facing both fast and spin bowling and has earned a name as a hard hitter, specially against pace bowling. He has shown the best batting performance this season in Royal College U-13 ‘C’ team and considered a good all-rounder as he also captured few wickets and assisted in some superb catches in the present season. Yasindu in his short cricket career has won many special awards. He was awarded as the U-11 Player of the Tournament at Fingara International Cricket Academy Cricket Carnival in 2018 February. Yasindu representing Jayawardena team has become the Man of the Final at the CCC School of Cricket 20th anniversary Inter-House eight-a-side tournament in 2018. Yasindu is also a member of the runner-up CCC Maroon team at the Inter Academy T20 Cricket Tournament 2018 organized by the Colombo Premier Cricket Foundation in last October. In this tournament Yasindu scored 43 runs against SA BLUE team with two sixes and five fours and scored 67 not out against SA RED team with 05 fours which helped CCC Maroons to book a berth in the final against Lucky Roger team. Yasindu hopes to continue his cricket career while striking a good balance with his studies.